Welcome to the historic place of Nepal, if you are looking for traveling to one of the most historical place of Nepal don't forget to visit "Lumbini - The Birthplace of Lord Gautam Buddha"
Lumbini is the birth place of Siddhartha Gautam who later known as Lord Gautam Buddha. Buddha is known as "the light of Asia". Millions of people around all over the world come here to visit. 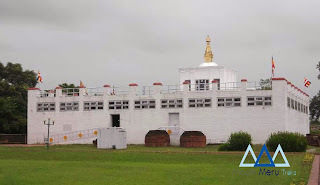 Lumbini is listed in the World Heritage Monument List by UNESCO. The Indian emperor Ashoka identified and set the Ashoka pillar in Lumbini which is the main attraction of this area. The other main attraction of this area is Maya Devi Temple, Scared Garden spread over 8 sq km and scared pond Puskarni where Mayadevi had taken a bath before giving birth to Gautam Buddha. Lumbini holds the historical and religious significance of Nepal. -built in the year 259BC, this pillar was built by King Ashoka, When he constructed this pillar, the King exempted the villagers from paying tax and gave out 100 golden coins to the people. In the seventh century, the pillar was struck by lightning and split into two parts. The site was lost for six centuries and covered with dense forest before being re found in 1895. The place was cleared and the pillar reconstructed. -This temple is supposed to be dedicated to Maya Devi, who is Buddha’s mother, which seems natural as Lumbini in famed as the birth place of Buddha. The temple was built during the 2nd century. Next to the temple there is a pool where Maya Devi used to bathe, now days the Japanese Buddhist Federations is re constructing new temple at this site. - A sanctuary is being built for the protection and breeding of endangered cranes in this area. It’s an interesting place to visit. - is the beautiful area around the Asoka pillar where you can spend some time relaxing and wondering around. - Many countries have built monasteries in this area, it’s possible to walk around and visit them as you like. Though the buildings are mainly in the new style. Want to Know More about Buddha's Life ? Buddhist Circuit Tour: The circuit provides insight into the life of Lord Buddha and the development of Buddhism. There are 62 archaeological sites scattered around Lumbini. The tour goes through Tilaurakot, Kudan, Gothihawa, Niglihawa, Sagarhawa, Aurorakot, Devadaha and Ramagrama - all bearing significance to the life and enlightenment of the Buddha. Tilaurakot: Identified by archaeologists as the capital of Kapilvastu, Tilaurakot lies 27 km west of Lumbini, where excavations are on to unearth the ancient palace of King Suddhodhan, Siddhartha Gautam’s father. The Buddha is believed to have spent the first 29 years of his princely life in Tilaurakot. Kudan: Located some 4.5 km south of Tilaurakot, Kudan is where King Suddhodhan met Lord Buddha for the first time after returning from his enlightenment. It was here that the Kasaya (yellow robe worn by monks) was presented to Lord Buddha. It was also here that the Kasaya was presented by Lord Buddha to Rahul, his son. Gothihawa : About 5 km from Tilaurakot, Gothihawa is where Krakuchanda Buddha, who preceded Shakyamuni Buddha, was born. Remains of a broken Ashoka Pillar and relics can be seen here. Niglihawa: About 8 km from Tilaurakot, Niglihawa is where Kanakmani Buddha was born. Here too one can see remains of a broken Ashokan Pillar. Devdaha: The capital of the Koliya kingdom and maternal home of Mayadevi, Devdaha is 35 km to the northeast of Lumbini. This is where Siddhartha Gautam spent his childhood. Sagarhawa : Forest site is identified by archeologists as the “Palace of the Massacre of the Shakyas” by the invading forces. The ruins of the ancient site lie on the west and south banks of a large rectangular pond known locally as Lumbu Sagar, or long pond, in Niglihawa village. Sagarahawa is 12 km north of Taulihawa municipality in Lumbini. Lumbini Village Tour: A walk through the villages surrounding Lumbini and interaction with the warm and hospitable local people, buying their handicrafts and observing their traditional rituals will bring one closer to understanding the diversity of the Terai cultures in Nepal. Village tours also give an opportunity to observe the Terai landscape and a peek into the locals’ agro-based rural lifestyle, colorful costumes, festivals which they celebrate with much joy and enthusiasm, and gracious hospitality. Visitors can also visit the local temples and mosques or partake in the cultural ceremonies. Wetland areas, lakes and ponds in the villages offer birdwatching opportunities. Visitors have the option of choosing to walk through the villages or ride in a local rickshaw or bullock cart. Some of the villages surrounding Lumbini are Ekala, Khudabagar, Tenuhawa, Lumbini Adarsh and Madhuvani.